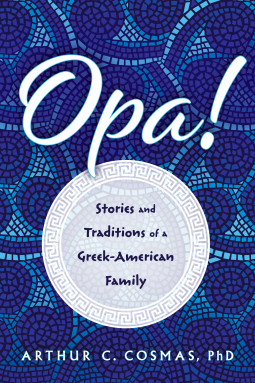 In Opa!, author Arthur Cosmas presents a loving portrait of what it was like to be brought up as a Greek American in the Greek community in the United States during the 1950s. Some of the topics the author covers include the Greek family, Greek holidays and religion, the Mediterranean diet—healthy as well as unhealthy—the agora, assimilation, chaos, superstitions, and the evil eye. In this engaging and lovable portrayal of Greeks, the author relates facts about Greek culture and then brings these elements to life through true-life anecdotes about his family. Entertaining and informative, Opa! is a look into Greek heritage and traditions. This delightful book will make you laugh, it might revive affectionate memories of what it was like for you growing up, and it will remind you that we are all more alike than we are different.